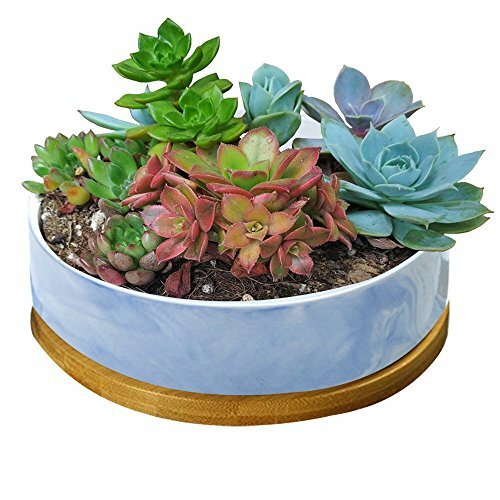 Each pot has a hole in the bottom for drainage, perfect for mini succulent and little air plants and plants that don't have a large root system and that are slow growing. and the interior is just the right size to hold a small potted plant and give your home a dash of fresh, natural greenery. Ready to brighten up your space? This charming mini planter is the best choice. You'd better measure the size of your succulent plant first and make sure that this pot is suitable for your plant. STAR-TOP is a US registered trademark, We have our unique packaging and GREETING CARD.We didn't authorize any other seller to sell our products, if there is someone sell our products illegally, we will reserves the right to be investigated for responsibility. Please notice our package,We can offer 30-Day Money Back Guarantee; 24-hour on-line service; If you have any problem about our product or service, please leave your message to us. We will solve it within 24-hour. If you have any questions about this product by STAR-TOP, contact us by completing and submitting the form below. If you are looking for a specif part number, please include it with your message.